After the dentist appointment we decided to browse the local Goodwill to kill time. We needed to wait for the numbness to wear off and the bleeding to stop before my daughter could drink a milk shake from the ice cream place down the block. It wasn’t until we got home that evening that she realized she was missing her tooth necklace, the one that contained her newly extracted tooth. If it weren’t for the tooth fairy thing, she probably wouldn’t have cared, but instead, naturally, she wanted to find it. Fortunately it didn’t take long for her to recall hanging it up on a hook in the Goodwill dressing room while she tried on clothes. It was too late to go back that evening but I was able to call and they said they’d hold it for me until the next day. I promised her I’d go get it first thing in the morning. When I got there in the morning I told the clerk I was there to pick up a necklace my daughter had left there the day before. He said he remembered me and proceeded to announce fairly loudly over the store PA system “the lady who left her teeth here yesterday is here to pick them up”. Did he really just say I was here to pick up my teeth? Suddenly it felt like everyone in the store was trying not to look at me but couldn’t help turning their heads to stare and I couldn’t blame them. A lady showing up at the Goodwill to pick up her teeth she left the day before? I would’ve taken a look at her too! As I was standing there waiting, I felt like grabbing the speaker to clarify, “Sorry that was a mistake. 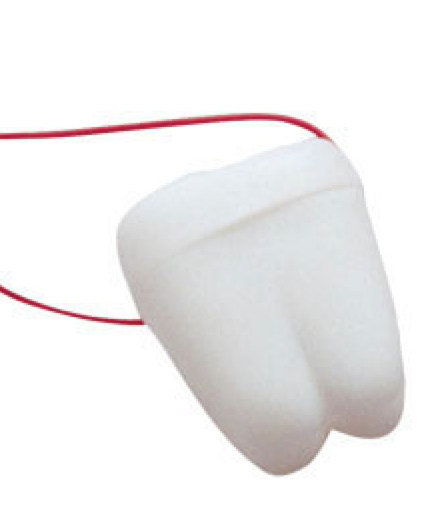 I’m actually here to pick up a tooth necklace– you know the kind dentists give kids– a white plastic tooth box on a red string? My daughter left it here yesterday after a baby tooth was extracted. We were here killing time and she left it on the hook in the dressing room. I’m not here to pick up my teeth. Knock on wood I still have all my originals in my head…just sayin’. You can go back to shopping now.” But instead I stood there, imagining what I would say while running my tongue over my teeth and silently thanking my parents and my adult self for all the years of investing in good dental care. When the clerk returned with the necklace and handed it to me I thanked him with a big toothy grin that I flashed around the store for longer than I might normally while I put the necklace around my neck. I brought it home to my daughter along with a good laugh.